Traveling on a budget is not at all a difficult task. Step 1: Go to Mexico. Just ask the throngs of Lonely Planet-toting backpackers that visit every year. But just how far can you stretch your greenbacks in Mexico? To absurd lengths, in fact. You can go to (and enjoy) our neighbor south of the border on just $30 a day, in some damn cool cities. Imposible, you might say. But the dollar is going farther than ever in Mexico at the moment, with an exchange rate of MX$18.50 to the dollar. Challenge accepted. ¡Vaya con dios! Once the New York Times named this overlooked foodie city as its top destination to visit in 2016, the megalopolis went from under the radar to an international hotspot in a hurry. That said, prices haven't caught up with the rep yet in Mexico City, or the "DF" as the locals (and now you) call it. Now is a great time to give it a whirl. What to do: Hop the metro for 5 pesos (25 cents) and head Downtown to the Centro Historico, where you can peruse (for free) historic sites such as the famous Zocalo and Mexico City Metropolitan Cathedral. Wander past the National Palace, the Federal Treasury, the Nacional Monte de Piedad. 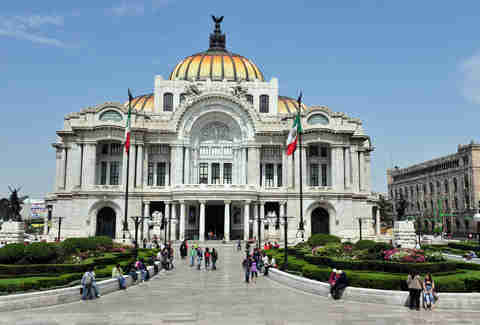 The gorgeous Palacio de Bellas Artes is nearby, and behind the Zocalo is the Templo Mayor, an ancient Aztec temple uncovered only in the 1970s. Get back on the metro (still 5 little pesos) and head over to Chapultepec Park, one of the largest city parks in the world, and a major injection of nature into sprawling Mexico City. Admission to the park is free, and worth a stroll. It's also home to the Museum of Anthropology -- an absolute must for any first visit to the DF. Here you will find archaeological and anthropological artifacts from all of Mexico's pre-Columbian indigenous cultures. And at MX$65 ($3) for admission, you can't go wrong. Where to eat: Eating on a budget in Mexico City is beyond easy, but you won't be dining in the glamorous restaurants in trendy Polanco. Oh no, it's street food for you, my friend. But this is an infinitely better and more traditional experience. In DF you can find cuisine from across the entire country. It's a dizzying array of tacos, tamales, quesadillas, roasted corn, grasshoppers (legit), all hot and delicious, all on a strict budget. The city’s indigenous tacos de canasta, filled with potato, refried beans, and chicharron, are easy to find throughout the city. They cost about 30 cents. Even if you eat 10 of them you aren't close to maxing out your budget. 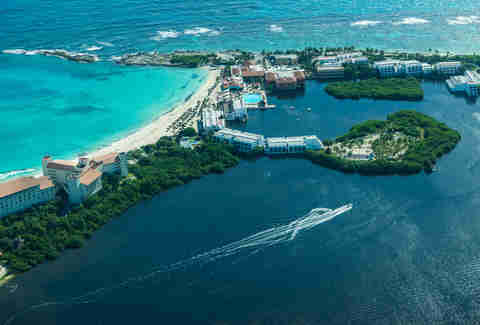 Cancun on a budget doesn't have to consign you to spring break-style all-inclusive accommodations with 30 other bleary bros. You can totally do Cancun in more sophisticated style on the cheap. 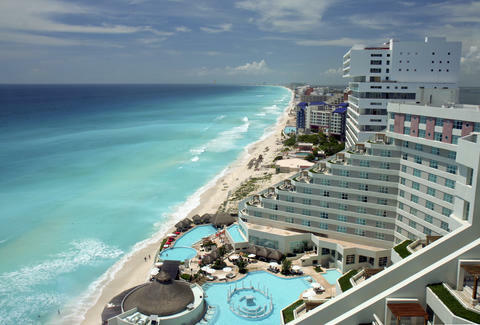 You won't be sleeping right on (or even near) the beach, but nothing in Cancun is far from anything else. What to do: Beaches in Mexico are public, meaning even though a hotel might sit beside one, anyone is welcome. You won't be able to enjoy the hotels' beach butlers without shelling out for a day pass, but you can still lay out your towel and BYO for free. The ADO bus will cost about 40 cents and will take you from almost anywhere in Downtown Cancun to the hotel zone (aka the beach). 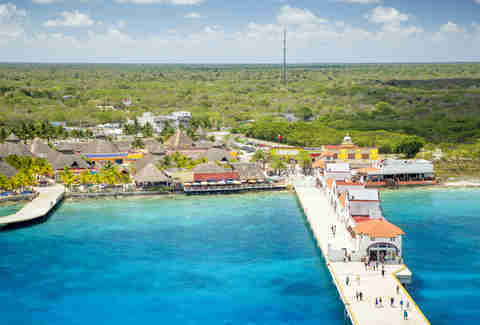 "Cancun on a budget doesn't have to consign you to spring break-style all-inclusive accommodations with 30 other bleary bros."
If you're feeling spendy you can board the ferry to Isla Mujeres, a laid-back island off the coast of Cancun. A far cry from the high-octane energy of places in the hotel zone like, say, Señor Frog's, Isla Mujeres is a sleepy fishing village with a lot of character. The town center is only four blocks by six, easy to cover in an afternoon… or in an hour. Scope out the sea wall murals, explore the boardwalk, and find the pirate tomb in the town cemetery. Grab the ferry from Cancun for about $8 round-trip. Where to eat: Unlike most Mexican cities, Cancun does not have a traditional zocalo. Instead it has Parque de las Palapas, the main plaza where you can find entertainment and affordable street snacks. Tacos are among the most popular food items in Cancun, and for these you'll want to visit Barbacoa de la Tulum on Avenida Tulum. There is also Los de Chiwas on Avenida Bonampak, Carnitas Michoacan on Avenida Las Torres, and Tacos Los Perrones on Avenida Donaldo Colosio. Tacos will never be more than $1 at these traditional stalls, but keep in mind most places run out by 11am and won't make more. An hour south of Cancun is its slightly more sophisticated sister, Playa del Carmen. Only 15 years ago Playa was a stretch of beach ringed by a small town, palapa beach huts, and fishermen. Today she's bloomed into a thriving beach city, packed with beach bars, restaurants, trendy boutique hotels (where you won't be staying), and a solid party scene. The crowd is a hearty blend of locals, expats, men who think it's OK to wear straw fedoras at the beach (and their girlfriend counterparts), and backpackers. 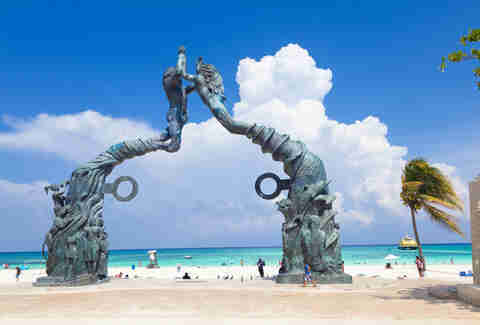 What to do: With so many tourists in a concentrated area, prices are higher in Playa del Carmen. Still, it's possible to take your additional $15 and have a fine day. You won't be out 'til 4am slinging back Coco Locos (as an adult you've outgrown those anyway, right? ), but you won't be sitting in your 10-bed mixed dorm room all night, either. The "beaches are free in Mexico" rule still applies, so that basically takes care of your day. Drinking on or near 5th Ave or the beach bars isn't going to be a cheap affair, where cocktails start at an egregious $4. Beer, at a buck or two a pop, will be your best option here. Try Wah Wah Beach Bar for the cheapest options. Or you can BYO and park on the sand. Mexico's ubiquitous orange-and-red drugstore OXXO sells snacks and beers, which are marginally cheaper than beers sold at any bar. The "beaches are free in Mexico" rule still applies. Where to eat: Eating on the beach is relatively cheap for a regular tourist. But you are not a regular tourist so you will not be eating on the beach. Instead you'll be eating at El Fogon, home of arguably the best tacos in Playa del Carmen. Tourists are on the verge of overtaking this late-night local spot, yet the local-spot prices still apply, with tacos al pastor hovering around 40 cents each. If you really want to splurge throw some cheese on that bad boy for an additional 20 cents. In the '60s Puerto Vallarta was a glamorous beach destination, made famous by Liz Taylor and Richard Burton (whose former home has been turned into a suuuuper-swanky hotel. Next time.). The buzz on PV (as the locals call it) quieted down until the past decade or so, as hotel development and attractions have sprung up. It's still among the chillest Mexican beach towns, which is saying something. Plus it's straight-up gorgeous, with spectacular sunsets behind the Bay of Banderas, and lush, jungle-wrapped mountains that tumble down to the water. What to do: Puerto Vallarta on a budget is a cinch. The vibrant, colorful city is jammed with cheap eats and action. 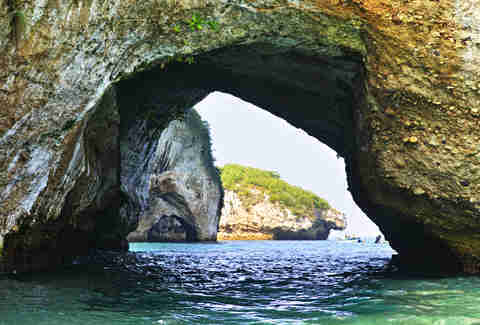 When you're not at the beach in Puerto Vallarta proper, you can take the bus to smaller, less touristy beaches nearby. Consider the beach "hike" from Boca de Tomatlan to Las Animas. This coastal walk is dotted with quiet private beaches that are perfect for secluded swimming and Instagrammable moments. The bus to Boca de Tomatlan from Puerto Vallarta costs 40 cents one way. A bus will also take you to Sayulita, a bohemian beach town about an hour north of Puerto Vallarta that's equal parts bougie-chic and leathery, unwashed backpacker. It's one of the most visited spots outside Puerto Vallarta these days, which makes it beyond touristy, but it's still worth a trip for more beach bars, art galleries, surfing, and people-watching. The bus to Sayulita costs about $2 one way. Where to eat: People in PV will argue to your face about the best tacos. You can't go wrong with late-night tacos from the various trucks lining the streets in the more residential section of the Romantic Zone, but if you want an establishment with actual light and chairs, Pancho's Takos is your jam. This nighttime hotspot is best-known for the beautiful, rotating, smoky, dripping hunk of pork that twirls as the cook cuts sensual slices of al pastor all night long. One taco is about 65 cents. If you're sick of tacos (if), you can grab a quesadilla for about $1.60, or a cheese fondue with veggies for $3.60. In Boca de Tomatlan you are urged to park yourself at Mi Ranchito, an open-air beach bar with thatched palapas on the water. Guacamole costs $4; quesadillas are $3.20; and fish ceviche (a MUST in PV) is about $4.80. Restaurants and bars tend to be a little more expensive in Sayulita. Still, it is possible to eat on a budget here if you know where to look. Tacos El Ivan is known for its tacos al pastor, which run for about 50 cents. El Metro doles out delicious tortas (Mexican sandwiches), which start at around $3, and are massive so chances are you won't need dinner. (But we know you -- you're eating dinner. And you can still afford to.) For fish tacos you might be tempted to stop at the Real Fish Taco, which is right near the beach. But you'd do better to head straight to Rinconcito, which is far superior and far cheaper (with far fewer tourists). For something sweet head to the Cake Lady, who serves flan and tres leches cake for about $1.15. The last time you were in Cozumel was probably on a cruise. Here's what happened: You got off the ship, headed straight for Señor Fro'’s, chugged beer and/or did some body shots, bought a T-shirt, sloppily kissed one (or many) equally sloshed seafarers, got back on your ship, and then checked Cozumel off your bucket list. Good job Cozumeling. But it pains me to say, you've barely scratched the surface. Get out of the cruise-line rut and you'll find a city epically stunning and rugged with gorgeous coastline and pristine jungle, packed with street art, and home to tasty treats -- all which can be enjoyed on little to nothing. What to do: With the second-largest barrier reef in the world, Cozumel's diving is nonpareil. If you can't splurge on scuba gear and a boat tour, go ahead and snorkel right off the shore. Buy your own snorkel, paddle out, and be marveled by the kaleidoscope of coral and fish. If you prefer to bake on dry land, the locals prefer the beaches Playa de San Martin and Chen Rio. Playa de San Martin is popular with young people who like to surf, while Chen Rio is more family-oriented with smaller tide pools that create smaller hot tub-like pools. Good job Cozumeling. But it pains me say, you've barely scratched the surface. Where to eat: For a local lunch, consider La Choza. It offers a local menu, where $4 will get you water, soup, and a main course, of which there are five to seven options. You will have to ask for the local menu, but you don't have to be a local to eat off of it. Cozumel is known for its "tapas-style" culture, as well. Locals like to visit small bars known as botaneros, which are essentially cantinas that give out free snacks as long as you keep drinking. And with beers hovering around $2, you could have a very filling meal for under $6. A botanero to know: La Yucatequita. For tacos, both El Foco and Mister Taco are great options. The Yucatan Peninsula (of which Cozumel is a part) is known for its cochinita, which is slow-roasted pork. For cochinita tacos or tortas, visit El Amigo Mario. This hole-in-the-wall taqueria serves only three things: cochinita tacos, cochinita tortas, and beverages. The tacos start at 80 cents. If you've got 30 bucks burning a hole in your pocket after a full day at the beach, you can buy three dozen. Meagan Drillinger is a travel writer living and breathing in NYC. But if you give her a plane ticket today, she will be somewhere else tomorrow. She like tacos, music, and making lists. But travel is her life.